Linda Ginenthal from Transportation Options talks about the new See & Be Seen campaign. Plus some of the theme song contest entries and talk about tips for winter riding, including how to keep your spirits up. Featuring Joe Kurmaskie, also known as the Metal Cowboy, on how touring across the country with his kids brought him to a new point in his life. Jerden Freeauf talks about a solo cross country trip. And ... the new THEME SONG. Featuring a special membership drive program with guest host Tim Calvert discussing the Springwater Trail and his other favorite off-street paths. We talk on the phone with children participating in National Bike and Walk to School Day. This month the KBOO Bike Show continues the theme of accessibility of biking. Guests include Ian Stude from the PSU bike co-op talking about programs for students. We also speak with Kirsty Hall from PDOT's Transportation Options Progrm Options. Kirsty recently implemented a new program to help seniors feel more comfortable biking and will tell us all about it. Sara and Ayleen interview Aaron Adam and Mike Rasmussen about how becoming regular cyclists has allowed them to loose significant weight, and what that journey has been like for them. Sara is joined by guest host Tim Calvert (of tall-bike commuting fame) and guests Carie and Allan Cougar - who tell us all about their recent month-long bike trip through Laos with their 2 yr. old cougar cub, Cody Wyoming. And in celebration of Portland's ongoing campaign and the mural project that is currently being painted on SE Hawthorne Blvd - We take calls on the subject of: SHARING THE ROAD. 6 Pedalpalooza event organizers join us to tell us about their cool events. Hosts Sara and Ayleen interview Dumpster Dave about his uncanny knack for finding screaming deals on bike gear, and consequently, his upcoming bike swap meet at Free Geek. They also inteview Dabby, a longtime local bike messenger. Dabby offers insight into the world of velo delivery and a culture that often seems like a tough nut to crack. Hosts Sara and Ayleen celebrate the artistic side of local bike culture with live music by the bike band the Trash Mountain Boys and guest Joe Biel from Microcosm Publishing. Joe has been distributing his zines by bike since 1996 and helps distribute bike- themed zines, stickers and patches. The KBOO Bike Show wouldn't be possible without the contributions of bike enthusiasts like you. 80% of KBOO's funding comes from listeners. Help give bikers a louder and more powerful voice! 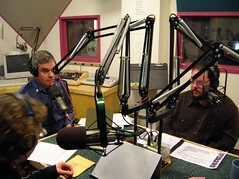 Make a contribution of *any amount* to KBOO today during the Spring membership drive. 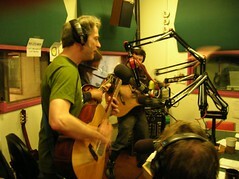 Call 503 232 8818 or go to KBOO.fm. Sara and Ayleen thank you, from the bottom of our bikey hearts (and that's deep)! Vladislav Davidzon, of the Portland Peace and Justice Center will talk about the Sustainable Energy in Motion bike tours, and Steve Kung from Community Exchange Cycle will talk about promoting peace through cross-border and cross cultural exchange bicycle tours. Sara will also be giving an update on the state of NYC Critical Mass and the World Carfree Network's legal observer project. Have you heard about the cyclist who blocked a TriMet bus and was punched by a rider who was let off the bus? Probably you have because it was front page news in the Oregonian. Well, the issue has really blown up. People have all sorts of opinions on the incident, but now they are also having heated discussions about the behaviors of TriMet operators. Even the folks of Breakfast on the Bridge are getting involved to give doughnuts to bus drivers as a thank you for sharing the road. Jonathan Maus's blog BikePortland.org has about 160 posts on all the TriMet articles combined! It's apparent people have a lot to say, so Kiran Limaye, TriMet Bicycle Coordinator, has been invited to come on the KBOO Bike Show along with bus operator Leroy Minner. Special guests, Bill Sinnot, Commander of the Portland Police traffic divison and Greg Raisman, PDOT`s traffic safety specialist discuss projects, programs and enforcement actions they are working on to make the streets safer for cyclists.